The CT1 cut-off timer was designed for use with vehicle installed equipment where the equipment is required to be operated even while the vehicle ignition key is removed. Typical applications include two-way radios, in-car mobile (cellular) telephones, flashing or rotating warning lights, headlights or spotlights, computers, GPS receivers, or any other equipment which would be powered directly from the vehicle battery. The CT1 is also useful for solar powered sites to prevent damaging over-discharge of the batteries. In stand-by mode the LED on the CT1 shows steady RED. 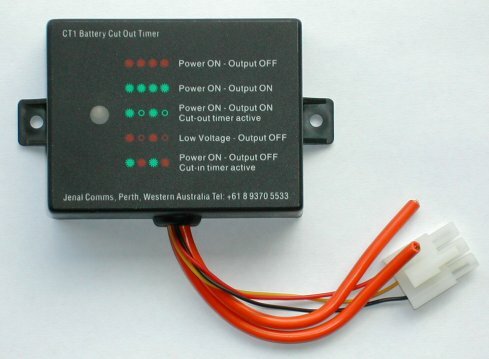 In operation the CT1 cut-off timer monitors it's control input line which would normally be connected to the vehicle ignition switch. While the ignition switch is on the LED on the CT1 shows steady GREEN and the output is also switched on, providing the battery voltage is above the low voltage cut-out point. When the ignition switch is turned off the CT1 starts it's cut-off timer and the LED flashes GREEN. After the end of the selected period the CT1 output is turned off and the LED changes back to steady RED (stand-by mode). If at any time the battery voltage falls below the pre-set low voltage cut-out point then the LED on the CT1 flashes RED>. If the ignition switch is off when the battery voltage rises to above the pre-set high voltage cut-in point then the CT1 will return to stand-by mode and the LED will show steady RED. If the ignition switch is on when the battery voltage rises to above the pre-set high voltage cut-in point then the LED will rapidly flash alternate RED/GREEN for the period of time determined by the cut-in timer. At the end of this period the CT1 output will be switched on and the LED will show steady GREEN. Connections: Power, Ground, Control (eg. Ignition switch), Relay contact in, Relay contact out. Matching 3 way connector & pins supplied.